Aren't you a little short, and 8-bit, for a Stormtrooper? If you have any love at all for the cuteness, then you will have stumbled across Tiny Towers, NimbleBit's build-your-own 8-bit playground. 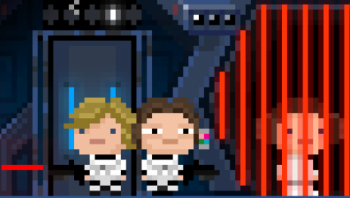 The Empire has invaded NimbleBit's space, for the first new Star Wars video game title since Disney bought out Lucas. "Intergalactic war is expensive, and space stations are, too," says LucasArts, as it sends out a distress call to gamers everywhere, asking them to help it construct Star Wars: Tiny Death Star on iOS and Android devices. "Do you have any idea how much it costs to build one the size of a moon?" No, nor had I realized how much of a hornet's nest of crazy it is to get an 8-bit model past the gremlins in quality control. Do you realize that every single one of those 8-bit loons had to first get modelled by Disney Mobile Palo Alto based on a style guide sent it by NimbleBit, then go out to LucasArts, and from there out to LucasFilm? All for the sake of making sure Leia's cheeks have exactly the right kind of rosy sheen, or Yoda's ears exactly the right shade of guacamole green? "Just about every character and every asset had multiple round trips to make sure we got it right," says Disney's Jon-Paul Dumont. Everyone knew they were setting an 8-bot precedent, and didn't want to get it wrong, which made them extra cautious. So don't you complain about those sprites, ever. They've suffered enough, poor things. Yes, it is free to play, and there's an Empire Bux offer on iTunes now if you feel that defending the Empire is a noble cause. Besides, that Wedding Room won't build itself!